Last March, Envision: seeing beyond magazine sent out a call for nominations of women who are leaders in various sectors of our industry. The response was terrific and the honorees were notified in early June. Listening to our instincts about where we can best serve others while realizing our potential is something that many of us aspire to.Wendy Buchanan has lived this process and her successful career path proves the wisdom of her approach. In 2007 Buchanan started training other people to help their clients choose eyewear. She created and sells BeSpectacular™, a training system that helps fashion consultants and eyecare professionals take the guesswork out of choosing the perfect frame. Young people are typically full of energy, yet few lead organizations before they’re 30. And Christine Breton admits that her age was a bit of a handicap when, in 2001, she became general manager of Montreal-based Opto-Réseau at age 28. Opto-Réseau is a buying club and business ‘banner’ group (each member owns their store under the name Opto-Réseau). Optical retailers can join the buying club only or become full members using the Opto-Réseau banner (along with buying club privileges). When Breton came on board the business had 14 full members out of a total of 20 buying group members. How was Breton’s youthful enthusiasm received? “Sometimes, too much energy and too many new ideas disturb the established order, but fortunately, with time I learned to better calibrate my efforts in order to accomplish my goals,” she explains. And accomplish them she certainly has: Opto-Réseau now has 53 full members and 30 buying group members. The realities of today’s market make the services of Opto-Réseau valuable indeed. “The market has been tough for many people. Today, each customer is hard to win and you have to be well-organized to reach them,” says Breton. Still young at 41,Christine Breton can look forward to many more years of productive work, especially in light of the fact that her energy and drive remain in full force. 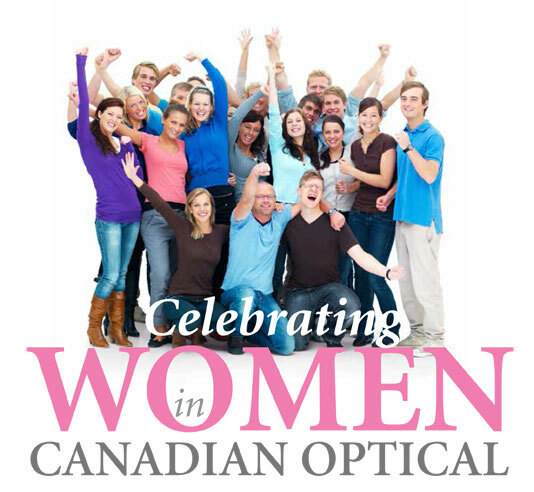 Opto-Réseau and Quebec’s eyecare professionals are fortunate to have her! *Note: Christine Breton is not related to Envision: seeing beyond publisher Martine Breton. Imagine taking out a loan to start a business back in 1978, when interest rates were an incredible 24 per cent. That’s when Diana Monea, then 22, and a new graduate of the University of Waterloo’s School of Optometry decided to launch her first practice in Regina. From that first practice, this farm-raised trailblazer began traveling to underserved rural communities throughout southern Saskatchewan, eventually starting two additional practices in Calgary. There she lives with her husband, Don, a computer engineer, who runs the business operations behind the scenes. Diana Monea has really led the way in bringing optometry to people wherever they are. In addition to 34 years of optometric practice, she served the elderly community at a nursing home in Regina for 15 years. She also worked with inmates at a correctional facility for over a decade, and as a low vision consultant at the Pasqua Hospital in Regina for many years, assisting both children and adults with visual handicaps to live as independently as possible. Her Calgary clinics also offer comprehensive health services to people with fibromyalgia and chronic fatigue syndrome. Her work also includes service as the chairperson of the Eye See Eye Learn programme, an eye-health programme for children in Alberta. In association with Essilor, every kindergarten child in Alberta has access to a free eye examination and those who need them receive free eyeglasses. It’s hardly surprising that Diana Monea was the first optometrist in Canada to create a website dedicated to providing eye heath information (www.eyehealthcentres.com). And in 2000, she was the first North American optometrist to profile case studies in optometry, drawing from an extensive database of over 200,000 eye exams she has personally performed. Monea has presented these cases at many professional conferences over the years, to much acclaim. The company her father, Rodney, began in 1962 is now known as WestGroupe and Beverly is vice-president, responsible for marketing and product development. The firm has expanded in a fashion-forward direction under her guidance but the transition wasn’t seamless. “My first model was too loud and colourful for our customers at that time. It wasn’t the runaway bestseller I had anticipated,” she says, with a smile. Both Beverly and her brother Michael, the company’s president, shared the goal of creating brands with the ability to go far beyond the conventional concept of a house brand. “In order to continue to grow and evolve our company, it was necessary to move beyond the value segment of the market, which was our strength. We focused on developing more of our own products and slowly we began to change our product positioning and company image,” she explains. Suliteanu followed this success with Fysh (for boomer-generation women) in 2006 and Evatik (for men) in 2010. Each collection bears her signature creative stamp. Traveling internationally for the business is a big part of Suliteanu’s job and her MBA in marketing and international business from Queen’s University helped prepare her for this role. Initially she accompanied her father and brother on buying trips to Italy and Asia, and as her experience grew, she assumed the leadership role in this area. Were suppliers comfortable in dealing with a woman? “It’s been an evolution but it was up to me to make sure they understood the role each of us plays in the company,” she explains. From her love of working on catalogues as a young girl to her life now as one of Canada’s leading designers and brand creators, Beverly Suliteanu has come a long way indeed. Let’s see what she comes up with next! Sheree Watson learned the art of a successful career switch out of necessity, and now shares her hard-won wisdom with the opticianry students she teaches. Watson, in turn, influences her students profoundly and they speak glowingly of her dedication to their success. Many of the students who enter the six-month diploma program choose it because it allows them to return to the work force quickly. A hearty thank you to all our readers for nominating these amazing women. Thank you, also, to our honorees: we appreciate you taking time from your busy lives to share your personal stories with us. Inspiration is the music in life that keeps us going: each of you has inspired us, as you have countless others.